Reproductive disease control and bull testing is more efficient. Fewer weaning rounds, therefore lower mustering costs. When should the mating period begin? Breeder nutritional requirements. In the most common systems the objective is to synchronize high nutritional needs of breeders during lactation with good quality feed (i.e. the wet season). Pregnancy lasts for 9.3 months (plus or minus two weeks). For your situation work backwards 9.3 months to start the mating period. Getting the bulls out. If there is a risk of not being able to get bulls out (e.g. in February), then the mating period may need to start earlier. Nutritional management before calving. If bulls have to go out earlier than desired (due to the wet season) and mating allows the first calves to drop in the late dry season, there will be a greater need for nutritional support for lactating breeders. This includes pasture management, stocking rate control and possibly energy supplements, such as fortified molasses. To improve conceptions following calving aim for store condition (3 out of 5 score) at time of calving. This can be assisted by Spike feeding at least six weeks before calving. This strategy is most economical when applied to pregnant maiden heifers, and where molasses or other high energy supplements can be accessed at a reasonable price. Age of calves at the first weaning round. Age at weaning is a compromise between having a shorter lactation period and weaning a bigger calf. 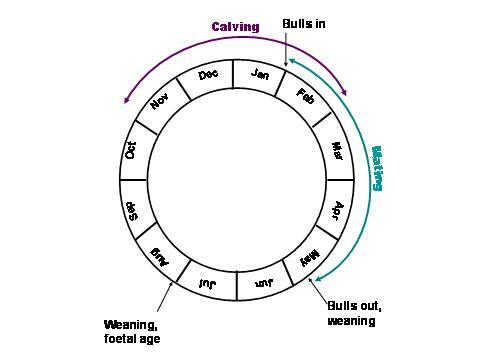 For example if the first weaning round cannot be done until May, and calving begins in late October (bulls in late January), then the earliest (oldest) calves will be seven months old at the first weaning. Facilities and systems for managing small weaners. The calving period in relation to when the first weaning round can be conducted, will determine the proportion of small weaners that need to be managed. Seasonal mating requires weaning some calves as early as 3–4 months to help preserve cow condition and reduce lactational anoestrus (not cycling). The poorer the nutritional conditions the more important this is. The harshness of the environment. In harsher environments, especially where molasses is cost prohibitive, it is best to start the calving season when adequate good quality feed is available. If calving starts too early, under poor nutritional conditions, it may take cows many months to recover ovarian function and start cycling. This will result in lower weaning percentages. Marketing policies. Marketing empty cows earlier in the year to take advantage of better prices and generate cash flow may be a consideration. What length of time should the mating period be? When first commencing seasonal mating a seven month mating period is recommended for breeders. This will result in two months when breeders are “lactation free”. Start by removing the bulls at the last weaning round of the year. A calving spread over five months can still be achieved through foetal aging at the last round and removing empty cows. However early pregnant cows will not be detected. Over time, a shorter mating period can be achieved with good nutritional management of breeders, targeted disease control, improved bull management and selection. Remember a minimum nine week mating is needed to give cows a 95% chance of conception (if they are all empty at the start of mating), and a further two months to detect pregnancies in the later cycling group. With shorter mating periods bull performance becomes even more critical and attention to bull selection for fertility is crucial, particularly if using low bull percentages or single sire mating. A shorter (3–4 month) mating period is recommended for maiden heifers to prevent dry season lactations. When should foetal aging occur? There can be a lot of variation between systems, production targets and marketing policies, and environments. This makes it difficult to state when foetal aging should occur without knowing the particular system. To detect all pregnancies foetal should be conducted no earlier than two months after the bulls come out. However if the bulls come out at the last round then foetal aging should be conducted then. Dry cows can be tested at the first round to identify sale opportunities. When seasonal mating it is very important to wean strategically to manage the body condition of breeders. In some years and in some environments it may be necessary to wean earlier to reduce loss of body condition, caused by the nutritional stress of lactation. If weaning is not carried out at an appropriate time, and is delayed, there is the potential to have the majority of breeders in low body condition all at once (and requiring supplementation). In addition to poor body condition, the suckling effect of the unweaned calf can impact on a cows’ ability to cycle. If cycling is delayed this can throw out the calving pattern and result in late calves and potentially lower weaning rates. Taking all the considerations into account, develop your plan by drawing it. Label the 12 months of the year either on a circle, graph or table. Identify when mating, calving, weaning and foetal aging will occur. The following two figures are examples. Once the basic plan is in place other management practices, such as supplementation and bull disease management, can be added. Segregating, and seasonal mating, of first and second calf heifers is a suggested starting point. If bulls can’t be controlled, seasonal mating can still be achieved by foetal aging and removing ‘late calvers’ or late pregnant cows. For more information on improving herd reproductive performance and genetics, a Breeding EDGE workshop is recommended.